It is the end of summer and the markets and gardens are overflowing with zucchini. Unfortunately, squash bugs took over my garden. So, I am relegated to enjoying the fruitful harvest of other local gardeners. I had so much extra zucchini from my community supported agriculture (CSA) pickup that I decided to shred it and freeze it, waiting for the perfect time to unleash the oven again. 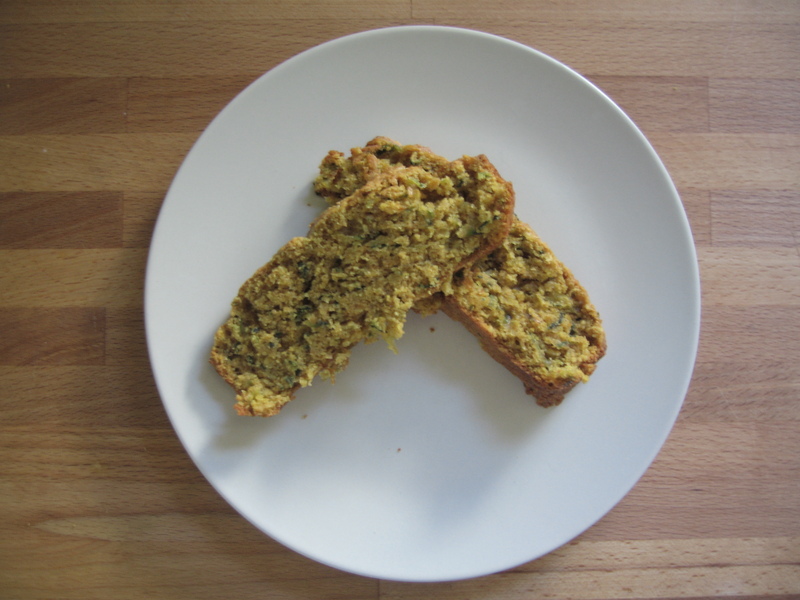 As the cool air has FINALLY came in, I decided to use my extra zucchini in a warm spiced zucchini bread this morning. Now, this ain’t your normal zucchini bread….get ready. It is bursting with amazing flavors and aromas that come from ginger, lemon zest, cinnamon, and…wait for it….curry powder. Ya, sounds weird…and I too balked at it when I first read the original recipe on Heidi Swanson’s blog 101 cookbooks.com. But seriously folks, I am a convert. 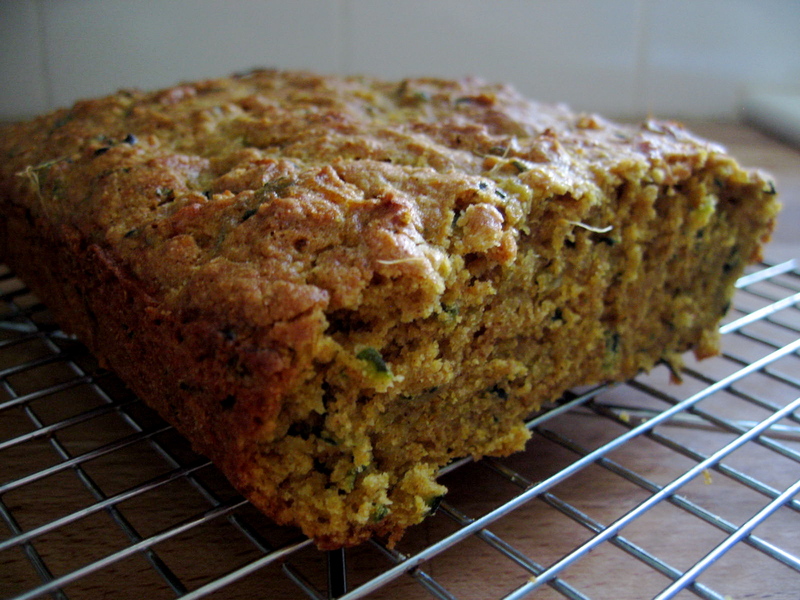 The warm golden color from the curry with flecks of zucchini are a sure fire winner in this quick bread. DO IT! Lemon-Ginger Zucchini Bread (adapted from 101cookbook.com), makes 1 awesome loaf. PREP: Preheat your oven to 350°F. Spray one 5×9 inch loaf pan with nonstick spray and set aside. In a small bowl combine lemon zest and grated ginger. Set aside. WET INGREDIENTS: In a mixer, beat the butter until fluffy. Add the sugars and beat until smooth. Add the egg and scrape down the sides of the bowl to all that goodness stirred in. With a wooden spoon, stir in the vanilla and then the zucchini. DRY INGREDIENTS: In a separate bowl, combine the whole wheat pastry flour, baking soda, baking powder, salt, cinnamon, and curry powder. COMBINE: Add the dry ingredients to the wet ingredients in two batches, stirring with wooden spoon between each addition. Fold in the lemon zest and ginger mixture. DO NOT OVERMIX! BAKE: Add the batter to the greased loaf pan. Top with nuts if you want. Bake for 45 to 50 minutes on the middle rack of the oven. COOL: Remove from the oven and allow to cool in the bread pan for 5 to 10 minutes. Remove from pan and allow to cool on a wire rack (or eat immediately, like me). EAT: Pour a big honkin’ glass o’ milk and ENJOY!